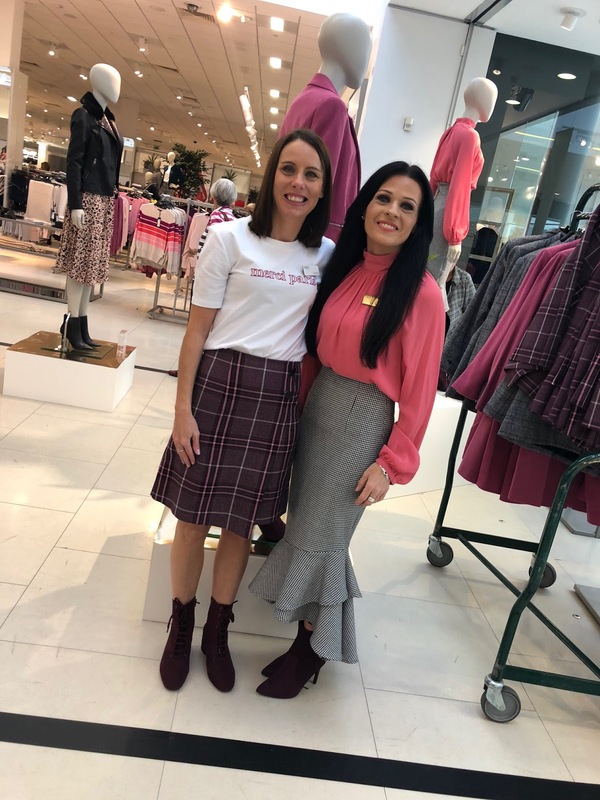 Last week I managed to get into M&S for the Holly's Must Haves launch. One of my friends from when I worked in the Bank, Jenny, is now working as one of the Fit & Style team at Sprucefield, Lisburn and she offered to pull the size 10's for me to try on on the day of the launch. When I arrived at 9.30, I couldn't believe the crowds and by 10am, the fitting room had a queue of women of all ages, trying on the range. I think that's what was so great to see - Holly's edit has such a broad appeal both in terms of age and colouring. There really is something for everyone. I should say for anyone not aware of the range that it isn't something that Holly has actually designed. Rather it's a capsule edit of some of the new AW18 M&S range and that's clever marketing as it keeps M&S as the driving force - Holly is simply picking her gems from the existing range. In any case, I'm always wary of celebrities designing clothes. 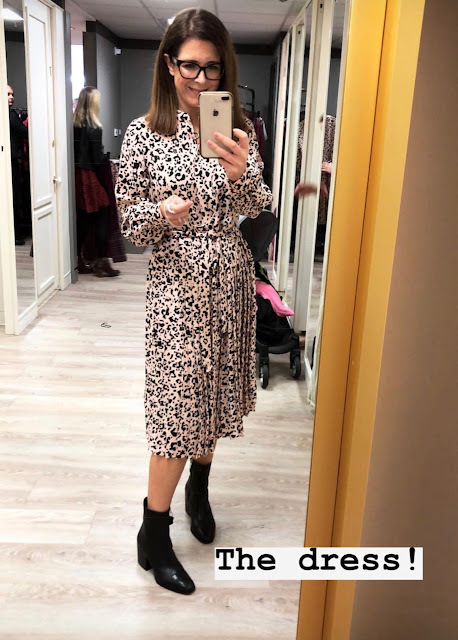 The range comprises 20 items and I tried on 11 of them - sizes were limited on the day and there were a couple of pieces I wasn't fussed about so didn't use valuable time trying them on. It's a lovely fit though and looks great accessorised with black. Beware of many other women wearing - I think it's the most recognisable piece of the collection....but having said that, I've only met one woman locally wearing the insta-famous jumpsuit. Next up and I knew I would love the checked wrap skirt. My favourite look for winter is opaque tights and a short coloured skirt - it's my workwear go-to. I'm wearing the checked skirt with my favourite part of the collection - the white slogan t-shirt. It's made from the loveliest soft cotton and the fit is really nice. It's the shape of a classic t-shirt but is shorter so it's perfect for wearing with skirts. Being wary of slogan t-shirts generally, I love that this is a subtle slogan and not an angry declaration or statement of intent! Then I added the pink coat - it's actually the pink version of the grey and green coats I featured on this last post. These coats are amazing value for being 30% wool and they're a great classic crombie fit. Size wise, I'm wearing the 10 and though it does come up big, I think I'd take the bigger size to allow for wearing with knitwear. 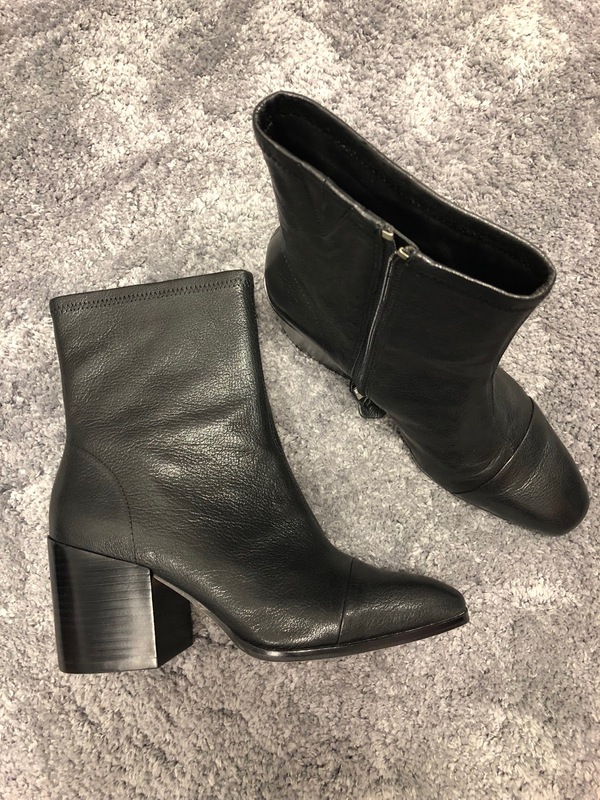 In all of the photos so far, I'm wearing the Autograph leather ankle boots and I'd highly recommend them. They've got a lovely chunky heel and are made from a soft pebbled leather. Next up, I tried the checked trousers and while they're a lovely cut and colour, I was reminded why I don't wear this style of trouser. Being pear shaped, the masculine cut of these isn't flattering on my hips. But they're a nice length and look good with my brogues (and with the loafers in the collection, which I didn't get around to trying but are on this link). Generally speaking, I think pears should avoid a patterned trouser..these would look amazing on an apple or boy-figure, giving a bit of definition to the bottom half. But I preferred it with the less busy bottoms - these super skinny jeans are a great fit and only £19.50! 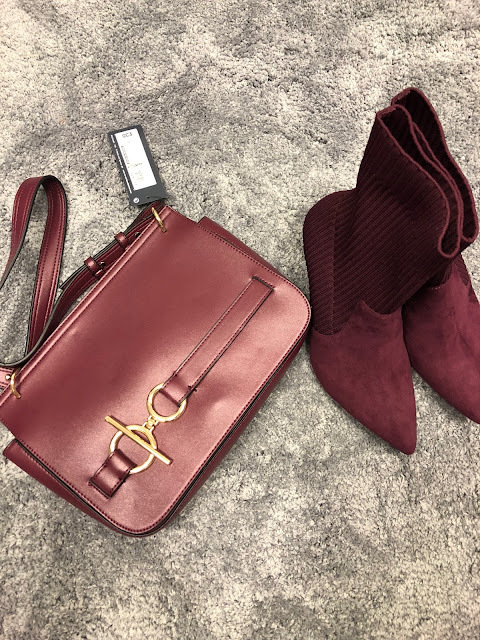 I changed my shoes for that last photo - wearing the stretchy ankle boots in burgundy. These look a bit unusual on first glance but they're a dream to pull on and off and are so comfortable. They come in black too. 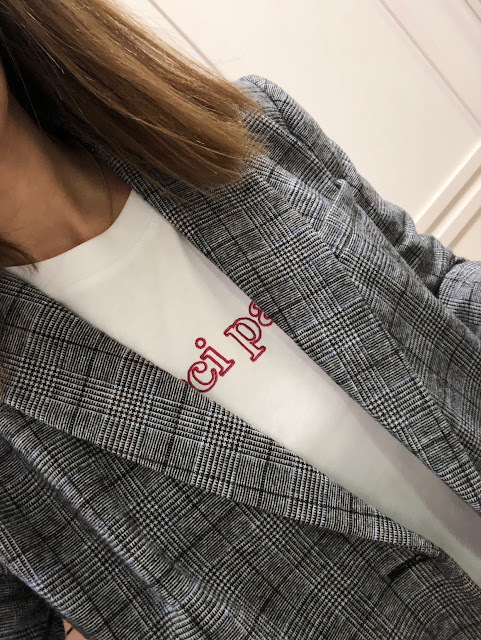 Finally, I tried on the check blazer with the jeans and the t-shirt. This is a lovely wool mix fabric and Holly says on her video that she chose it for the boxy fit but I wasn't a fan of the shape. I'd rather a slightly longer line single breasted one myself but it's going to look great on an apple figure. Last product I want to mention are the trainers. They're not available in-store so I couldn't try them but they look like a fantastic white leather trainer. My overall verdict? 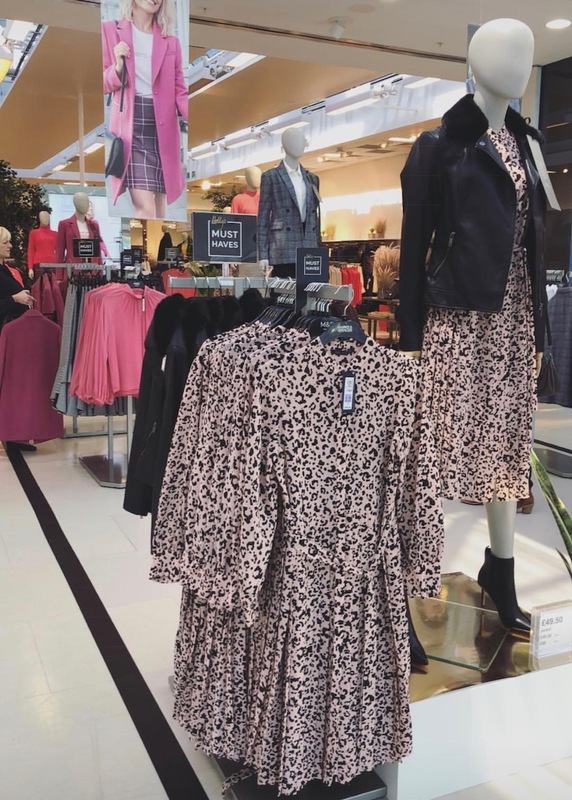 I think it's a great collaboration for M&S and at a time when high street retail is struggling, it's so good to see something positive happening that's getting people excited. Holly is a great choice given her appeal across many age groups and her likeability - she's well known by all age groups, unlike Alexa Chung or Twiggy, who aren't perhaps as visible to the general public as much as Holly. She's also a safe bet - the edit isn't too fashion forward and that's good. 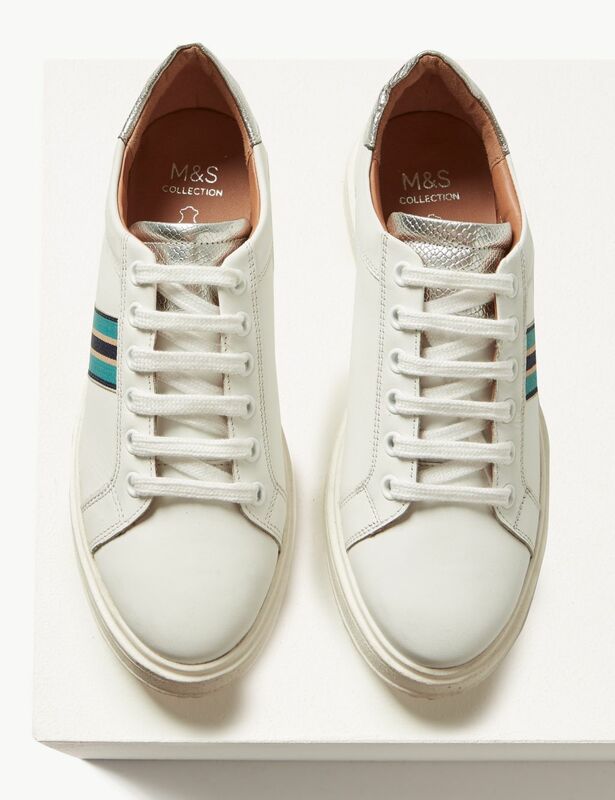 M&S shoppers are desperate for good quality, wearable items with a nod to fashion trends. Not full-on trend pieces that the press and bloggers get over excited about for a moment in time. Having said that, I thought it was a bit too safe overall - I would have liked to have seen some faux fur and a bit of floral to clash with the check. And perhaps less of a focus on one colour. There was one point where I came out of my fitting room to 5 women around me all pretty much dressed the same because the pink game was strong. That definitely put me off buying the coat. But bring it on M&S with the collaborations - let's get Mary Portas next. And before I go, just a quick mention for the Fit and Style team at Sprucefield. It's a free service that's available in 35 of the bigger M&S stores in the form of a bookable 1 hour appointment. You simply chose the reason for the appointment, workwear, wedding etc., supply your sizes and leave the rest to the team there. A fab option for anyone who doesn't enjoy shopping or has limited time to find an outfit for an important occasion. I didn't know about it until I met Jenny on Thursday as it's a relatively new concept and I can recommend it in Sprucefield - the girls are so lovely and friendly. They make shopping a pleasure and help to pick the best from what is a huge and overwhelming store. More information on this link. Disclaimer - this post is not sponsored. Some of my links are affiliate links which means M&S know you came to their website from mine and they may pay me a tiny commission if you buy and keep any items. This doesn't change the price of the item for you and the modest income I make from these links over the course of a year goes towards the running costs of this blog. Thank you for supporting the brands that support this blog. Loving the pink coat and the trainers! I bought the trainers a few weeks ago and they are lovely Avril they have a bit of a thicker sole which I love.